Description: Being known for its rich flavor, delicious aroma, and minimal number of calories has made Cantaloupe on of the most popular types of melon in the United States. Tack on the fact that it is loaded with Vitamin C and you know you have found a winning combination. Cantaloupe range in color from orange, to yellow, to salmon and have a soft juicy texture. When ripe the rinds change color from green to tan or yellow between the skin netting. Pick Cantaloupe when the stem separates easily near the point of attachment. Spacing: Plant 18″ apart in 60″ rows. Outstanding Features: The seeds of this fruit are also edible. 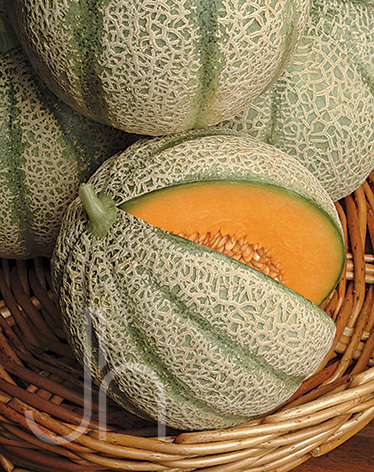 Tips: These melons are very tender and should be planted after the last chance of frost. Cantaloupe is a warm-season crop that grows best at an average air temperature of 65 F to 75 F. They require regular watering.